How have you used SUMN data? Consider sharing examples fact sheets, posters, issue briefs, PSAs, videos and more, or get inspired by the examples in our Gallery. To submit an example, please include...which community it was created for (i.e., town, school district), who the primary audience is (i.e., parents, community leaders), which project it was developed under (i.e., DFC, SPF SIG, SHIP), and any other helpful information regarding how the data product was created or disseminated. Thanks! Absenteeism in Itasca County: SUMN Fact Sheet. 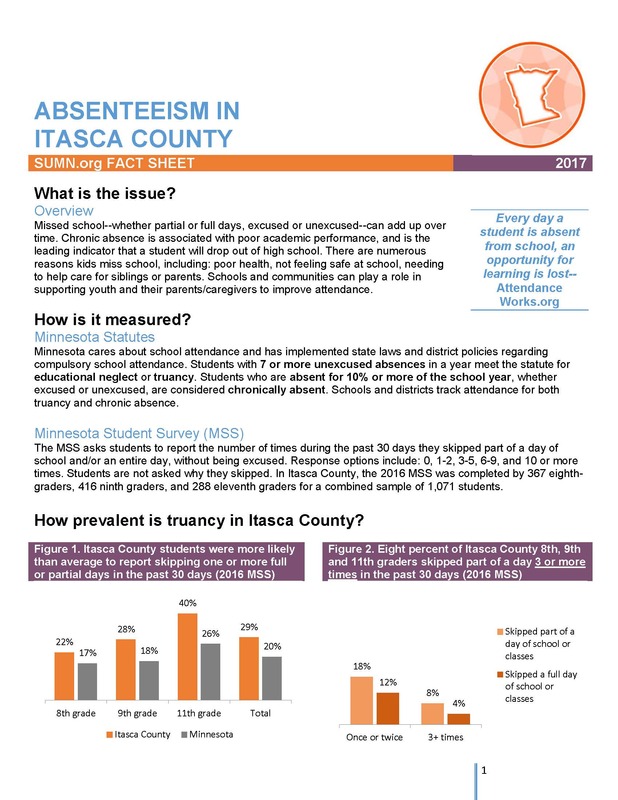 Topic: The 2017 four-page fact sheet explains the definitions and prevalence of absenteeism in Itasca County, and provides resources to address the issue. Team EPIC: Encouraging Positive Impact for Change in Roseau County. 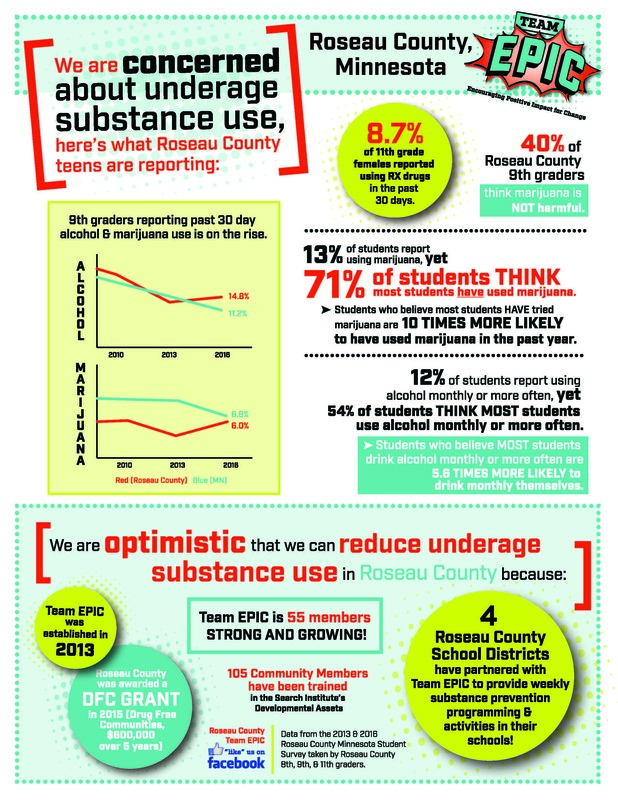 Topic: The 2016 one-page infographic explores teen substance use in Roseau County, Minnesota, and provides detail on the county's Drug Free Communities grant. Live Above the Influence: Sherburne County Substance Use Prevention (SUP) Coalition's Marijuana Use Poster. Topic: The 2017 one-page poster gives facts on marijuana use and prevention. The Lakeville Area Proactive Approaches to Health (PATH) Coalition has created an infographic on youth substance use prevention. 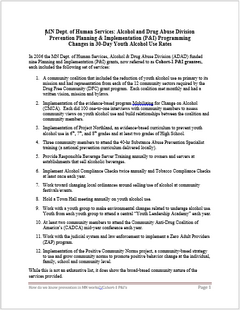 Topic: The two-sided PDF (shown here as two separate PDFs) shows the importance of youth substance use prevention, and the importance of caring adults in the lives of those youth. To find out more about PATH, check out their Facebook page. ACEs and Mental Health: Adverse Childhood Experiences. Topic: The one-page infographic illustrates the links between adverse childhood experiences (ACEs), mental health, and protective factors. The PowerPoint presentation explores ACEs in Minnesota through data generated by the Minnesota Student Survey. The presentation provides information about prevalence, protective factors, and other associations of ACEs, as well as a brief background on the survey. 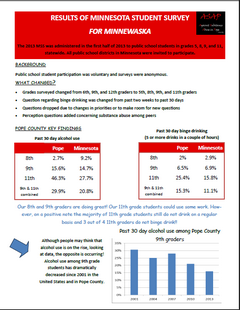 Data for both are taken from the 2013 Minnesota Student Survey (MSS). 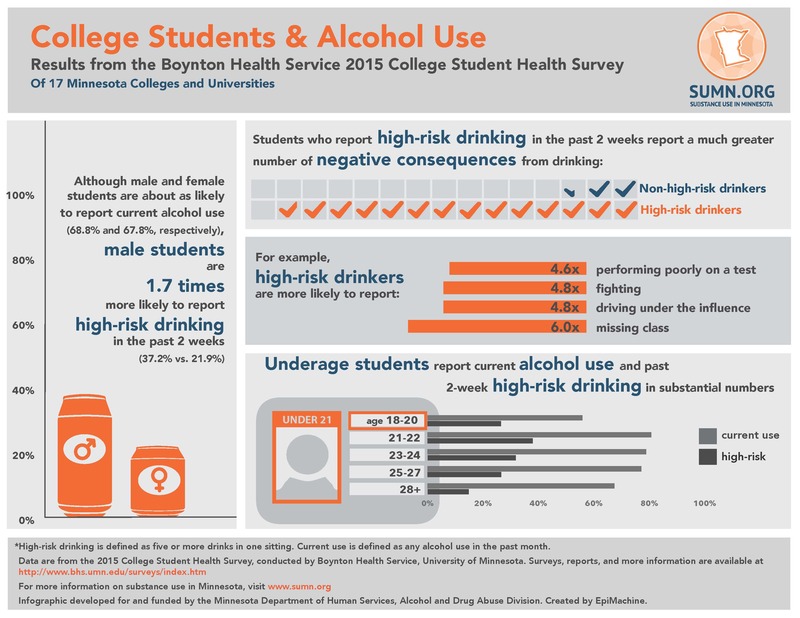 Using data from Boynton Health Service's College Student Health Survey, this infographic highlights pertinent facts about Minnesota college students' use of alcohol. 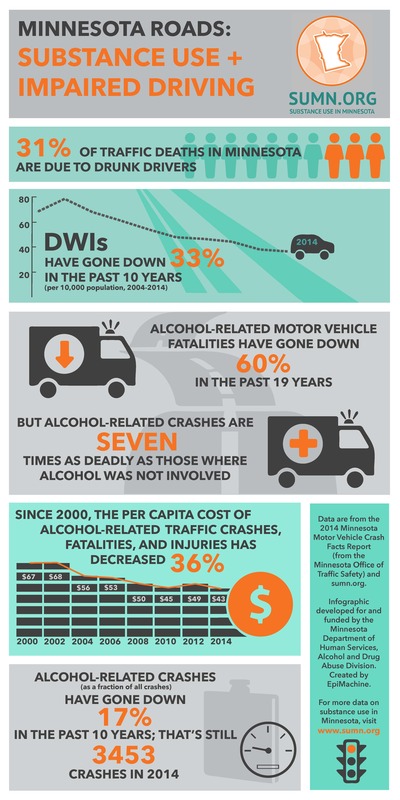 This infographic illustrates the state of impaired driving in Minnesota. Topic: The one-page PDF uses data from the Minnesota Motor Vehicle Crash Facts Report from the Minnesota Office of Traffic Safety. All data are easily searchable on SUMN.org. 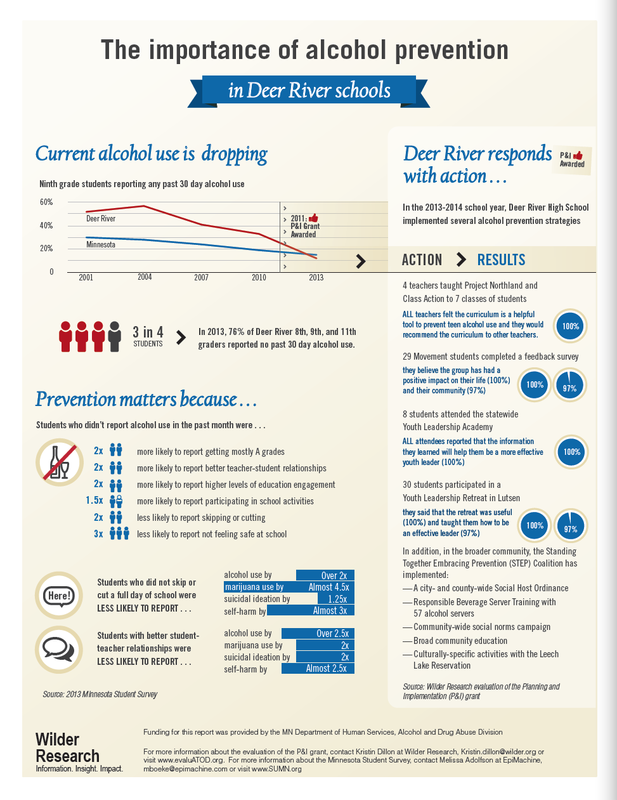 The one-page PDF infographic shows data about students' alcohol use in Deer River, Minnesota. Topic: "The Importance of Alcohol Prevention in Deer River Schools," was developed using data from the 2013 Minnesota Student Survey. It highlights actions and results from the county's 2011 Planning and Implementation grant. 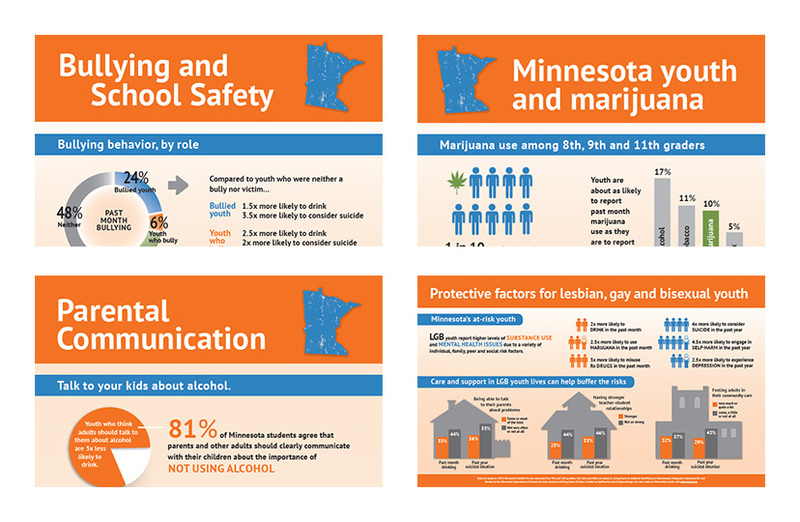 Four infographics cover issues relevant to Minnesota students, using data from the 2013 Minnesota Student Survey. Topic: The one-page PDFs cover risk and protective factors related to students' substance use: bullying and school safety issues; Minnesota youth and marijuana use; parent-child communication about substance use; and lesbian, gay and bisexual students. These three issue briefs highlight Olmsted County prevention efforts and substance use data. Topic: The first issue brief provides data on levels of youth alcohol consumption, with comparisons to the state and by grade, as well as on risk factors such as modes of access to alcohol, perceptions of harm, perceptions of peer use, and parent involvement. The second brief describes social host ordinances and provides data on where Olmsted youth access alcohol. The third issue brief on compliance checks provides local-level data on compliance failures, and details best practices for implementing checks. Two fact sheets describe environmental strategies implemented by Kanabec County, and a set of talking points describes current prevention efforts. 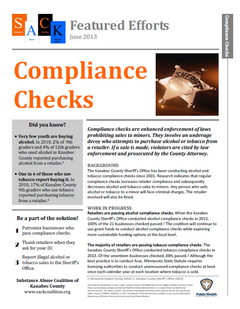 Topic: The first fact sheet describes what compliance checks are, provides Minnesota Student Survey data on Kanabec County youth purchasing alcohol or tobacco, describes steps being taken by the Kanabec County Sheriff's Office and the Substance Abuse Coalition of Kanabec (SACK) County, and lists ways that community members can help. The fact sheet on social host ordinances follows a similar format, and includes data on youth getting alcohol at parties.The Prevention Efforts documents provides talking points about a variety of strategies being implemented. The SACK Coalition use these documents at community events, city council meetings, school board meetings, and at township association meetings to educate stakeholders. 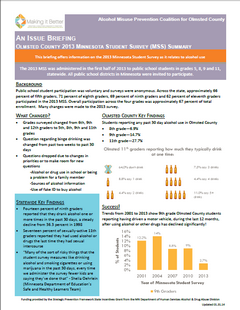 Topic: The two-page issue brief describes the 2013 Minnesota Student Survey and provides data on Pope County students' alcohol use and contributing factors. The press release uses 2013 MSS data to highlight how few Pope County students report drinking. The presentation (which utilizes TurningPoint clickers) provides numerous statistics from the 2013 MSS on alcohol use and contributing factors; it highlights students' misperceptions about peer use. The focus on positive data--students not using substances--has been well received. This animated presentation provides findings related to adverse childhood experiences (ACE) from the 2013 Minnesota Student Survey. 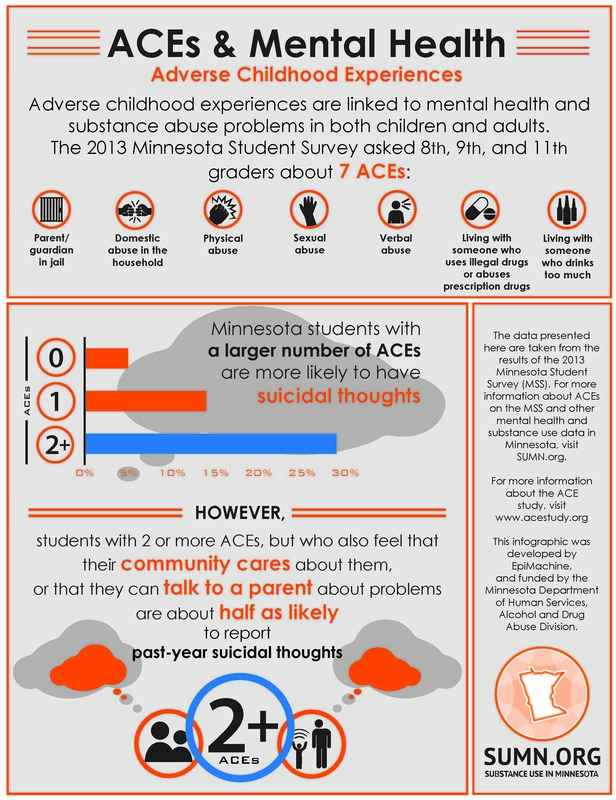 Topic: Data are provided on overall ACE score, as well as mental, physical, and chemical health outcomes associated with ACEs for Minnesota students. 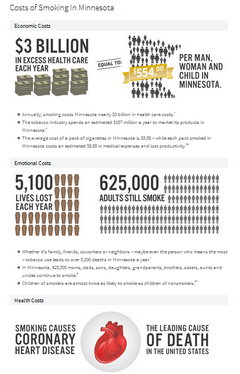 This infographic highlights key statistics on economic, health, and social costs of smoking. Topic: ClearWay Minnesota's infographic provides data on smoking prevalence in the state, smoking-related mortality, and health care costs. 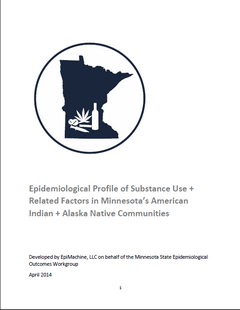 These four epidemiological profiles provide behavioral health data for African American, American Indian, Hispanic/Latino, Asian and Pacific Islander Minnesotans. Topic: Each profile provides summary data on alcohol, tobacco, and other drug use, consequences, and contributing factors, as well as data on mental health and factors associated with both substance use and mental health, from a variety of state and national sources. Topic: "91 Academic Outcomes Among Youth with Incarcerated Parents in Minnesota," was created in November of 2014. This evaluation report provides findings from Minnesota's Planning & Implementation grantees. Topic: Significant decreases in past 30 day alcohol use among Planning & Implementation grantees, as compared to the state average, are highlighted in this report.